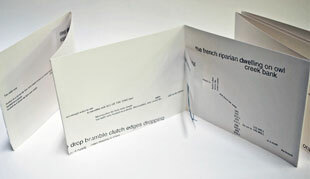 www.kenyon.edu: " Ellen Sheffield is a visual artist who explores the relationship between language, materiality and time through small-scale hand held objects: artist's books. 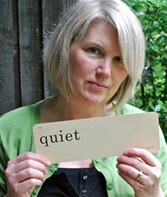 … A graduate of Case Western Reserve University, the Cleveland Institute of Art and the Ohio State University's Moritz College of Law, Ellen teaches book arts at Kenyon where she collaborates with poets, musicians and artists in her Gambier studio, Unit IV Arts." Gambier, Ohio: Ellen Sheffield, 2018. Edition of 16. 9 x 6.375"; 24 pages. Text printed letterpress from polymer plates and wood types. 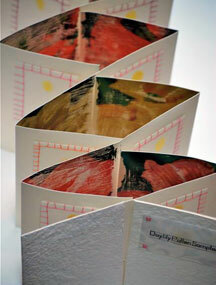 Includes inkjet prints and letterpress on Rives paper. 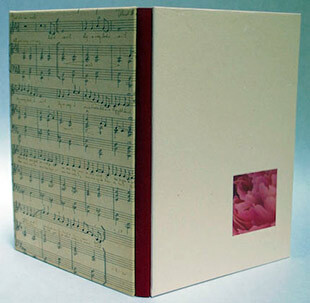 Bound in handmade Morgan cotton abaca paper over front board and bookcloth on back board with printed musical score in Miss Anderson's handwriting. Drum leaf binding. In paper four-flap cover with announcement of performance on March 11, 1930 printed on front. Signed and numbered by the artist. Colophon: "Peony (Paeonia) bushes can live for a century. Mine was transplanted from my husband’s grandmother’s garden after her death. Grandma Bertha Hammonds was a so-called colored cleaning woman her entire life in our small town where Marian Anderson performed in 1930. So too were Ethel Reynolds, Gertrude Jones, Viola Booker, Mable Mayle, Anna Sites, and Midge McGee. Miss Anderson’s mother in Philadelphia also scrubbed floors to support her young daughters. This artist’s book is inspired by these women and their drive to bring beauty into their communities in the face of exclusion and racial prejudice. "My thanks to Ric Sheffield and to Nancy Zafris for their research and writing about the colored women’s clubs and Marian Anderson. 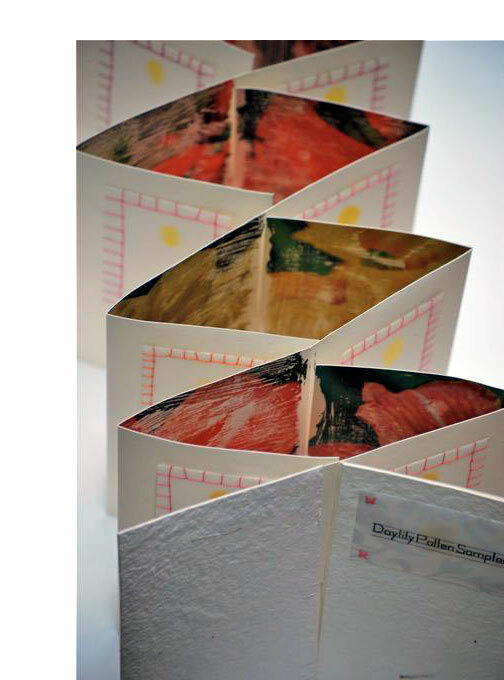 Studio support for this project was provided by the Morgan Art of Papermaking Conservatory and Educational Foundation Artist Residency Pro-gram ... 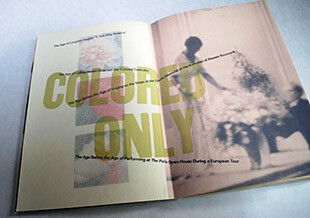 Images are courtesy of the Shared Shelf Commons of Penn Library’s Rare Book & Manuscript Library Image Collection Marian Anderson Archives and the Knox County Black History Archive. Additional images include my photos of Mount Vernon, Ohio’s historic Woodward Opera House’s vintage wallpaper, and Grandma Hammond’s still blooming peonies. 'The Ages of Peonies' is my found poem constructed from newspaper accounts, historical research. Additional text includes the lyrics to the spiritual song 'Sometimes I Feel Like a Motherless Child.'" www.wikipedia.org (accessed 10/29/2018): "Marian Anderson (February 27,1897 – April 8, 1993) was an American singer…one of the most celebrated singers of the twentieth century. … Anderson became an important figure in the struggle for black artists to overcome racial prejudice in the United States during the mid-twentieth century. In 1939, the Daughters of the American Revolution (DAR) refused permission for Anderson to sing to an integrated audience in Constitution Hall. … With the aid of First Lady Eleanor Roosevelt and her husband Franklin D. Roosevelt, Anderson performed a critically acclaimed open-air concert on Easter Sunday, April 9, 1939, on the steps of the Lincoln Memorial in Washington, D.C. before a crowd of more than 75,000 people." Gambier, Ohio: Unit IV Arts, 2001. One-of-a-Kind. 8 x 6"; 8 pages. Accordion. Transfers on Rives. Ellen Sheffield: "Cite/Sight Specific is a concrete poem I wrote based on the briefing of an actual legal case about riparian (water) rights woven together with an accounting of Tibetan monks carrying the colored sand from a mandala they had created in the library at Kenyon College down the hill to pour as a blessing into the Kokosing River. 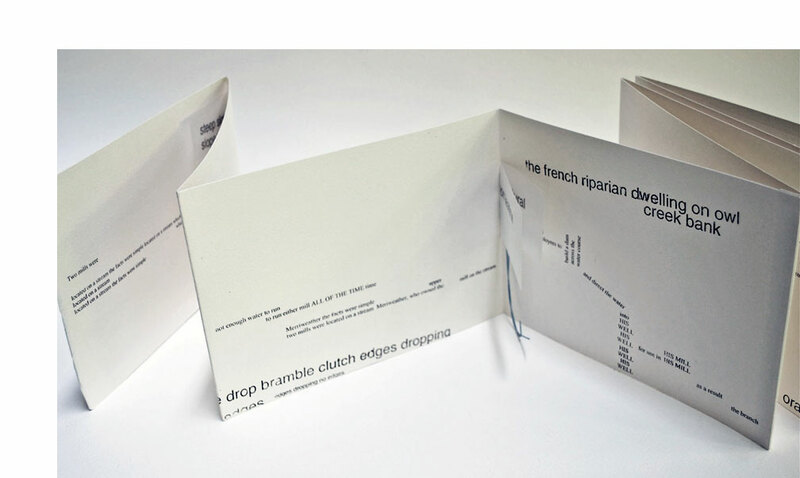 As a law school student I spent three years briefing cases and often daydreamed about creating poetry from the visually rich legal language of property law – this artist book is one of many using legal language as found poetry." Gambier, Ohio: Unit IV Arts, 2008. One-of-a-Kind. 7.25 x 6"; 22 pages. Double accordion structure, with two double-sided accordions (one side has photographs of day lilies, the opposite side has corresponding pollen samples) backed to each other with every other fold attached so that when pulled open the photographs can be seem on the inside of a collapsing/expanding 4-sided polygon. Ellen Sheffield: "In the summer the gardens along Middle Path in our small village are a riot of color with every variety of day lily blooming. I photographed the lilies, and collected samples of pollen from each variety to use as pigment in this color sample artist book. I was a bit disappointed to find that the pollen was all the same shade of yellow, although I gave each sample its own distinct name. I was further dismayed to discover that the pollen evaporated and faded shortly after applying it to the stitched sampler pages. I gathered more pollen and 'fixed' it with beeswax (most likely a crime against nature) and transferred the daylily photos to the inside of the double accordion with mat medium."